"Eric, at a tractorpull in Ottertail, Minnesota(1994). He was driving a J.D. 720 Diesel"
Eric had fun at this tractor pull. Not only did he win 3rd place, but he was able to share his victory with the rest of his band members who spent the weekend away from the cities. 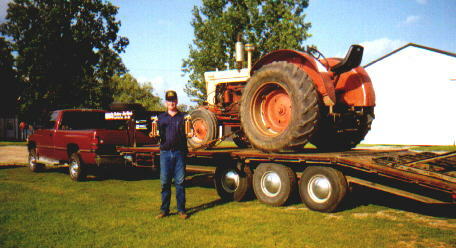 "Eric with just 2 of the trophies won, pulling with this 900 Case in 1998"
Eric had bought this tractor and just a short week later had entered it in a tractor pull in Richville, Minnesota, where he won 1st place twice. Once in an 8500 lb. class(pulled in 3rd gear) and the next in a 9500 lb. class(pulled in 3rd gear). A week or so after that he won 1st place again, when he used this same tractor at the Finn Creek Days in New York Mills, Minnesota, in a 9500 lb. class(pulled in 2nd gear). Since that time, he has found the tractor to be what he is looking for, so he decided not to sell it.